Ranked 163rd in the money list and in danger of losing his card after battling through all three stages of Q-School to win it back last season, the 40-year old Waterville man knows that a win or even a runner up finish at Circolo Golf Torino would solve all his problems. Given his form this season - eight cuts made in 17 starts - that’s a tall order. But on Thursday he was pleased just to card six birdies and drop only one shot in a best-of-the-afternoon round that left him tied for fifth behind a trio of leaders on a course that’s made for him - short and tight. “I saw when we got here for the practice rounds that the course just suits me eye,” Higgins told European Tour Radio’s Nick Dye “It’s only the first round and I’ve had a good round and have to build on that now because I haven’t had a great season. 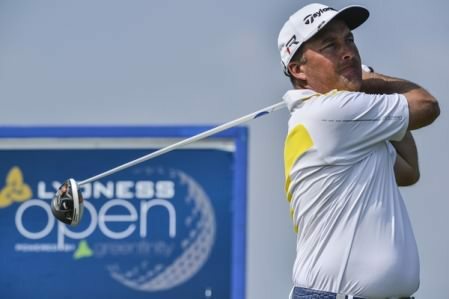 Belgian Ryder Cup player Nicolas Colsaerts, who was forced to withdraw in Holland last week due to illness, was back on form to share the lead with Ricardo Gonzalez and Max Kieffer after they carded seven under par 65s to lead by one from Australia’s Marcus Fraser. While he’s not the longest hitter on tour, Higgins is still one of the straightest and having seen in practice that the course was right up his alley, he hit nine fairways and missed just four greens in a controlled round. “I’m delighted with it, I played lovely,” Higgins said. “The course really suits me. You’ve got to drive it straight and good iron play will do well out there. Higgins has made his last two cuts but needs more than €125,000 to get inside the Top-110 in the Race to Dubai who will keep their cards. A top finish in Italy - a win (obviously) or second - would erase any worries but the Kerryman has been around too long to fall into the trap of thinking too far ahead. “I hit four iron shots to this [indicating tap-in distance] so that cures any putting issues,” he explained. “But I also holed a few nice six and eight footers as well. The one green I did miss, I found it very hard to get it up and down and made bogey. Simon Thornton - a winner this year - echoed Higgins’ feelings about the course and took advantage to post a four under 68 worth a seven-way tie for seventh. 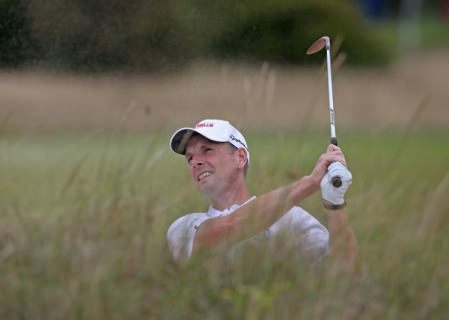 Damien McGrane shot a trademark, one under 71 to share 44th but his close friend Peter Lawrie is on the wrong side of the cut line again after a one over 73. The Dubliner struggled to hit fairways and greens and, as Higgins pointed out, saving par proved too tough for a player who is slipping closer to the relegation zone as the season progresses. He’s made just one cut from six starts since he was 10th in The Irish Open (a modest share of 58th at Gleneagles worth just €4,574) and fall from 79th to 106th in the money list. The 39-year old has also broke 70 just twice in his last 15 rounds and has slipped down the ball-striking rankings this year, especially for driving accuracy. Ranked fifth on tour for driving accuracy in 2009 (72% of fairways hit), Lawrie was seventh in 2010 (71.7%) and third in 2011 (74.4%) before slipping to 15th last season with 70.6%. This year, the 2008 Spanish Open champion is 65th with 63.9% and as a result he’s ranked 86th for greens in regulation this year compared to 16th in 2010. Nicolas Colsaerts in action in the first round of the 70° Open d’Italia LINDT ©Getty ImagesGareth Maybin, who is a comfortable 82nd in the Race to Dubai standings, shot a two over 74 while Michael Hoey had 34 putts and no birdies a five over 77. 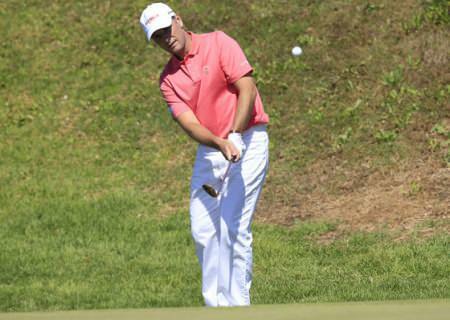 As for Colsaerts, the Belgian started the day with a bogey at the 10th and then went mad. He birdie the next six holes in a row and seven of the next eight to turn in 30 before following nine pars his back nine with a birdie at the last. “Apart from the bogey at the tenth, my first hole of the day, I got off to an amazing start and was kind of flying on my front nine,” said Colsaerts. Asked how he had recovered from the illness he picked up in Holland, Colsaerts’ comeback was up to his usual high standard. “Nothing beats being back home with your mum looking after you – everyone knows that man,” replied the man commonly known as ‘the Dude’. Kieffer may well need some of the same treatment. The young German, who lost in that unforgettable nine-hole play-off at the Spanish Open to Raphaël Jacquelin earlier in the season, admitted he was suffering from the cold and not feeling his best about coming to Italy but he soon banished any doubts with a fine 65. Gonzalez, meanwhile, produced his own brand of outstanding play. The big Argentine was at his prodigious best as he covered his last seven holes in five under to join the lead. Francesco Molinari, playing around the course he learned to play the game along with brother Edoardo, leads the Italian challenge on four under par. 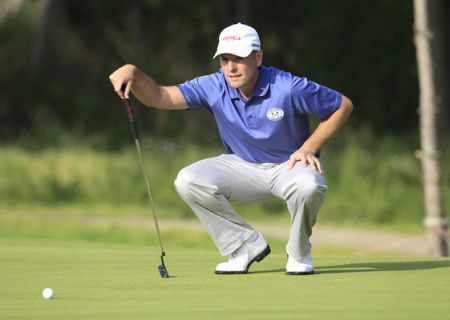 His younger countryman, Matteo Manassero posted a two under 70 but the home performance of the day arguably came from Circolo Golf Torino’s 16 year old amateur Edoardo Raffaele Lipparelli, who managed to open his European Tour career with a three under 69. Meanwhile, on the Challenge Tour, Galgorm Castle’s Gareth Shaw has work to do to make the cut in the $400,000 Kazakhstan Open after opening with a two over 74 at Nurtau Golf Club in Almaty..
He’s tied for 85th, two shots outside the projected cut and 11 behind Dane Jeppe Huldahl, who carded a spectacular course-record nine under par round of 63 to take a two shot lead.